March 3 – 13 at the 81st Geneva Motor Show, Automobili Lamborghini will debut its V12 replacement for the Murciélago. But early in this year at the 2011 Qatar Motor Show, held from January 26 – 29 at the Exhibitions Centre in Doha, auto enthusiasts received a preview of the highly exclusive and appealing vehicle making its World premiere at Geneva: The Gallardo LP 560-4 Bicolore. This Special Edition super sports car will be produced for the European and Asian-Pacific markets only. The North American market will only have access to the LP 550-2 version. As its name implies the Gallardo LP 560-4 Bicolore features an exclusive two-tone finish with matching interior and offers a full range of standard equipment. A refined contrast between the black roof and the color of the rest of the body (available in a choice of five shades) further emphasizes the sharp, dynamic lines of the Gallardo LP 560-4. This simultaneously enhancing its sportiness while adding a touch of elegance. The most successful super sports car in Lamborghini’s history captures the imagination. The brutal power of its 560 hp V10 engine, the absolute grip of its permanent all-wheel drive and the razor-sharp precision of its chassis. Make every kilometer in the Lamborghini Gallardo an intense experience of explosive dynamics and absolute control. Its breathtaking performance is indicated by the 3.7 seconds it takes to reach 100 km/h and its top speed of 325 km/h. The success of Lamborghini’s unequalled design DNA lies in the beauty of highly concentrated power and precise function. The Gallardo is the sheer essence of form with a purist approach. The body shell is crisply sculpted and completely free from decoration. A timeless piece of design presented as an uncompromising driving machine – the Lamborghini Gallardo. Even more extreme, thanks to a personalized appearance with its new Bicolore model, Lamborghini is now setting a further design highlight in the ten-cylinder model series. The colored exterior finish matched with the black on the upper area of the body gives the Gallardo a new, more aggressive personality. It looks even wider, even more extreme and innately adhered to the road. From the window-line upwards (including pillars, roof, engine hood and rear spoiler), the vehicle is decorated in Noctis Black – a pastel black that contrasts perfectly with the lower area of the body. This is available in a choice of five colors: Giallo Midas, Arancio Borealis, Grigio Telesto, Bianco Monocerus and Blu Caelum. 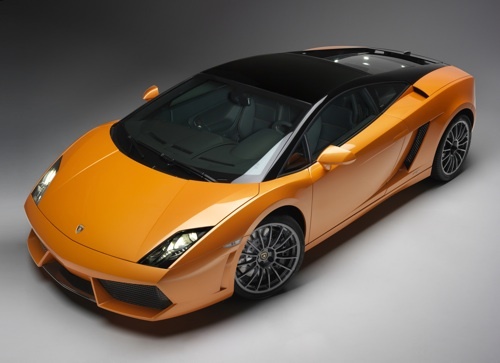 The exterior appearance of the Gallardo LP 560-4 Bicolore is enhanced by Skorpius aluminum-alloy rims. The 15 thin spokes are forged to minimize unsprung weight and are finished in titanium gray enamel. The air intakes and front spoiler have a high-gloss black finish, as does the upper section of the rear diffuser. The contrast between black and color is repeated in an understated, elegant manner in the interior of the Gallardo LP 560-4 Bicolore. The instrument panel, seats, door panels and other elements in the passenger compartment are upholstered in the finest “Nero Persus” leather, with a refined contrast provided by precise stitching that is colored to match the exterior paintwork: yellow, orange, blue and gray (also used on the Bianco Monocerus version). The bezel of the e-gear transmission on the center console is in Nero Noctis, just like the upper area of the vehicle. Obviously, the interior is finished in the Lamborghini tradition using only the materials of the very highest quality, which are crafted with undisputed professionalism and fine Italian workmanship.